Reminiscent of Twilight as far as locations go, McKenzie's story is truly original. Having been to Austin myself (though not to Washington), I would definitely be dismayed to leave the carefree, music-loving, Drafthouse viewing life of Austin to move to the endlessly rainy Northwest (though I hope to visit Seattle in the next two years). But since Sunshine and her mother, Kat, are very close, the move isn't so bad. Of course, no one wants to wake up in the middle of the night to the sound of footsteps, let alone the light footfalls of an undead child. It is very difficult to be so successful in one area (YouTube for McKenzie) and translate that success to another medium (in this case part one of a series); however, McKenzie accomplishes that and so much more. Unlike the last few books on this Halloween book list, this horror story is more subtle and nuanced. McKenzie takes her time to develop Sunshine, Kat, and Nolan as characters, and she allows the secrets of Sunshine's past slowly unfold. McKenzie isn't trying to keep you up at night, but she's hoping you take Sunshine and the spirits that follow her into your dreams. 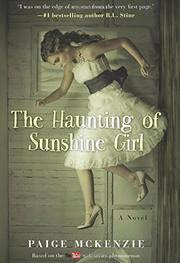 Having grown up on Fear Street novels (five at time if I could get away with it at the library), Sunshine fits right into the suspenseful, page-turning world of horror. She already planted the seed with YouTube, but her series revitalizes the genre in prose.